2019 SUMMER LESSONS COMING SOON! Our Annual Summer Lessons are taught by local golf professionals at participating Monterey County courses and driving ranges throughout the summer. Juniors can enroll in one or more series of five, one hour lessons that are limited to five students for an optimal learning environment. The Online Registration starts June 3rd*. 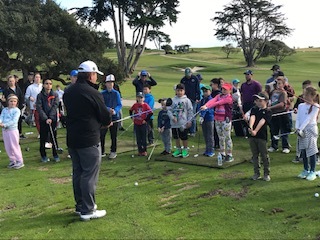 THANK YOU to all who came out to our Free Golf Clinic on Saturday March 2, 2019; also a big THANK YOU to Bayonet Blackhorse Golf Course, Justin Russo PGA, Nick Nelson PGA and Travis McCabe PGA, and the many volunteers that made the day a huge success. Planning our next clinic coming soon! 12 players each from AT&T Junior Golf competing against 12 players from Santa Cruz Junior Golf, in a Ryder Cup Match Play format. The Players were decked out in team uniforms provided by Pebble Beach and Antigua for AT&T, and Santa Cruz and Linksoul for SC, thank you to our Associations and your sponsorships! The course was in great shape, the matches were close, birdies and fist bumps on both sides, and in the end, AT&T Junior Golf retained the Bay Cup with a score of 6-4. 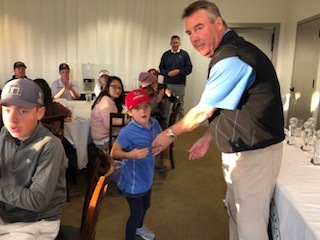 Our AT&T Pebble Beach Bronze and Copper players came out in full force this past Sunday, with 36 juniors coming for a fun, tournament style on course learning experience! A big thank you to all our pros, board members, and volunteers who walked with each group offering advice, learning opportunities, course management, general tournament and golf wherewithal and etiquette! Our next event, Quail Lodge Tournament on Sunday, September 23, 2018. New Special Event for Bronze and Copper players! September 9! Please join us for our FUN, EDUCATIONAL event, our Peter Hay Bronze and Copper Crash Course on Sunday, September 9! Tee times will begin at 9am. In this fun event we will help you get the rust off, shake off the nerves, help with "how" to play tournaments from the check in process, what shots to hit when, how do we play fast, how do we keep each others score, and most importantly, HOW DO WE HAVE FUN! We'll save the competition for next time, enjoy a great learning opportunity from our PGA Professionals, Board members, volunteers, and helpful parents during the 6-holes for all players. We're there to help, sometimes we all just need a little "crash course"! Best of all - the cost for this event is FREE just signup on BlueGolf for our Peter Hay Crash Course. The field is limited to the first 50 players so sign up now, and we look forward to seeing all you Bronze and Copper Players at Peter Hay on September 9! Since its debut in 2014, the USGA’s PLAY9™ program has focused on encouraging more people to play more golf, more often. The program aims to showcase the nine-hole round as an ideal solution for both avid golfers and newcomers alike to get out and play in a time-friendly and engaging way. 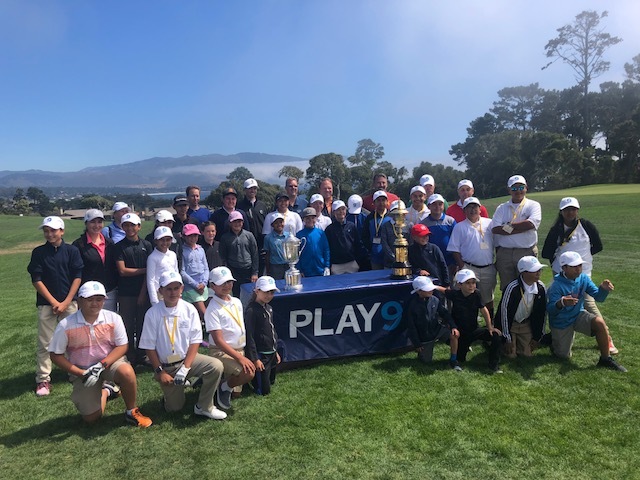 AT&T Pebble Beach Junior Golfers were fortunate to participate in the PLAY9 event at Peter Hay Golf Course on Sunday, August 5th. AT&T Pebble Beach Junior Golf Association is a local non-profit organization created in 1988 to introduce the game of golf to young people between the ages of 6 and 17 who live and attend school in Monterey County. The Association now has approximately 1,300 junior golfers who have benefited from the various activities offered by the Association.